Hadley's party was delightful, thanks mostly to the company but also in part to the corned beef Hadley's grandmother made overnight for the party, and today I'm sharing the steps for making her birthday onesie. Last week I shared the instructions for making her party garland, which looked adorable hanging above the mantle. Kudos to mom Meghan for accessorizing with the "happy birthday" blocks. People don't mistake us for sisters for nothing. Below are step by step instructions for creating a custom t-shirt design using freezer paper. There are tutorials for this all over the web, but this might be the first tutorial that uses my favorite color, glitter. Considering Hadley owns a fur vest, it's about time she start wearing a little bling now and then. 1. Determine your position / layout of your printout. I made the letters, "lucky", and my shamrock "1" separately and then laid them out as desired. 2. Cut out a piece of freezer paper large enough to cover your artwork. Freezer paper has a waxy side and a paper side. Place your piece of freezer paper over your artwork paper side up. Trace your art onto the freezer paper. Here's my completed freezer paper trace. 3. Place your freezer paper onto your cutting surface. Using your x-acto pen, cut out your artwork. Keep in mind that the freezer paper will become your stencil, and your cut-outs will be discarded with one notable exception - if you need to create an "inside" for your stencil, like if I had written "hadley" instead of "lucky", I would need to keep the "insides" (i.e. negative space) of the letters "a" and "e" to use later when I got to the ironing step described later. Let the cutting begin. 4. Next up comes the freezer paper wax sandwich. Trim any excess paper from around your cut-out stencil, and then cut a new, similar-sized sheet of freezer paper from the roll. You are going to use these two sheets to make a wax paper sandwich. The "paper" side is going to be the bread, your shirt (or onesie, pillowcase, whatever you're using) will be the turkey, and the "wax" side of the paper is going to be the mustard and mayo, meaning they should be the sides touching the shirt (or the turkey, whatever's easier for you to remember). Working on your ironing board, slip the non-stencil piece of wax paper inside (or under) your fabric. This will help prevent the paint from bleeding through once we get there. 5. Place your stencil on top of your fabric, ensuring that the bottom piece of wax paper lines up well. Then just iron away on medium-high heat until the wax side adheres to your fabric surface. It took me about 2 minutes of overall ironing to get a good grip. 6. Now comes the paint as well as the best part - the glitter. Because I wanted the letters to be pink (and non-glittery), I placed a piece of masking tape over the "lucky" part of the stencil so that it didn't get contaminated with the glitter. If I were more patient, I could have done the "lucky" part first and allowed it to dry, but naptime is only so long, so caution (and drying time) were thrown to the wind. Starting with the shamrock section and a small brush, I painted inside my stencil, being sure to get good clean coverage around the edges. Also, it's better to do a few thin, even coats rather than trying to get 'er done in one shot, so hold onto your glitter for the next coat. Because my green paint has a metallic shimmer to it, the first coat actually looks more copper than green, so even if I weren't bedazzling this sucker I'd still need two coats to get a pretty green color. After this layer dried, I went in for the second coat and then glitter-bombed the heck out of my wet second coat. Then I moved onto my "lucky" pink letters. This also only needed two coats, likely because the letters are thin. If you are doing larger patches of painted space, you may find that two coats won't be enough. Once the pink paint was dry enough to not welcome any rogue green glitter, I peeled off the wax paper (um, over the garbage can of course) and shook off the excess glitter. I waited a few hours before peeling of the bottom piece of wax paper, which is still in place in the photo above. Ipso schmipso, your shirt is done. Gladly Hadley's shirt held up with only one or two rogue glitter dots migrating to her hands or face. I brushed/shook off the excess glitter a number of times so as to avoid covering anyone who touched the birthday girl in green glitter. Can we just look at Hadley again? In fairness I have no idea how "washable" this is. 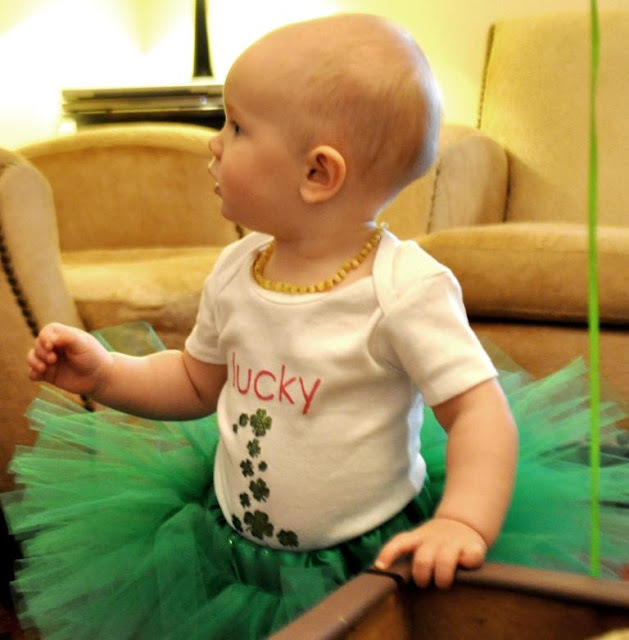 I figured between the shamrocks and the "1", this onesie isn't something she'll be wearing to a Fourth of July cookout. Maybe I'll see if I can talk Meghan into washing it (in her washing machine) to see how it turns out. If you give it a try, let me know. Hi, thank you for sharing. Such a great tutorial! I posted your tutorial on my blog with a link back to your blog, hope it’s ok http://makeitandwearit.blogspot.com.au/2012/05/birthday-t-shirt.html. sounds great! glad you liked the project!